Fish Tacos have become one of those fashionable street foods that everyone is re-inventing and folks are dying over. 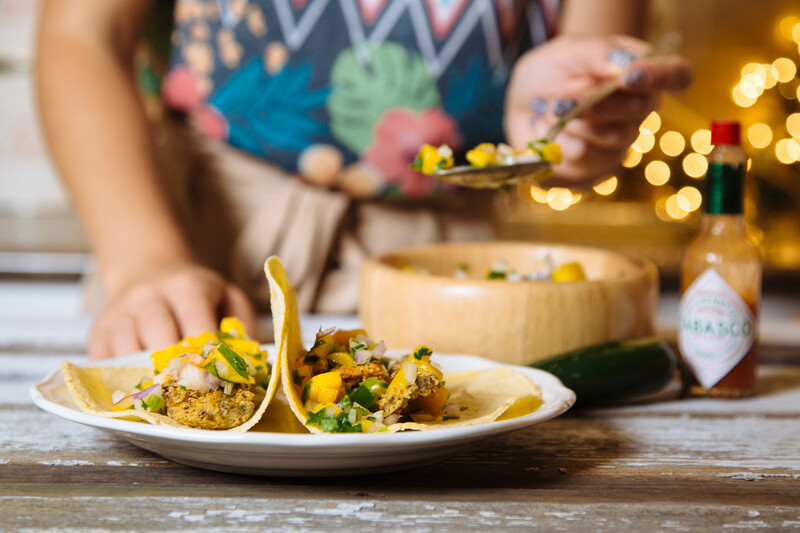 Baja-style cooking, and the tacos it provides our salivating mouths with, originated in an area of Baja area of Mexico because of their abundance of seafood. Baja-style cooking loves fresh and light ingredients like coleslaw and salsa, paired with sauces robust in flavor, all to compliment crispy battered meats or “meats” in this case. What makes this truly a vegan fish taco is the smell and taste that the seaweed gives the mushrooms. You can make almost anything “fishy” by simple adding some seaweed for the sea-salt flavor. Mushrooms are a great meat alternative because of their meaty texture. Oyster mushrooms are especially good for seafood-type dishes, but Portobello’s will work for these tacos as well. Of course you can always use this recipe as a base and use whatever fish-alternative your heart desires. As I mentioned before, this recipe is perfect for an evening with guests because you can simply layout the ingredients and allow everyone to build their own! It is easy prep and who doesn’t just love to DIY their own taco? 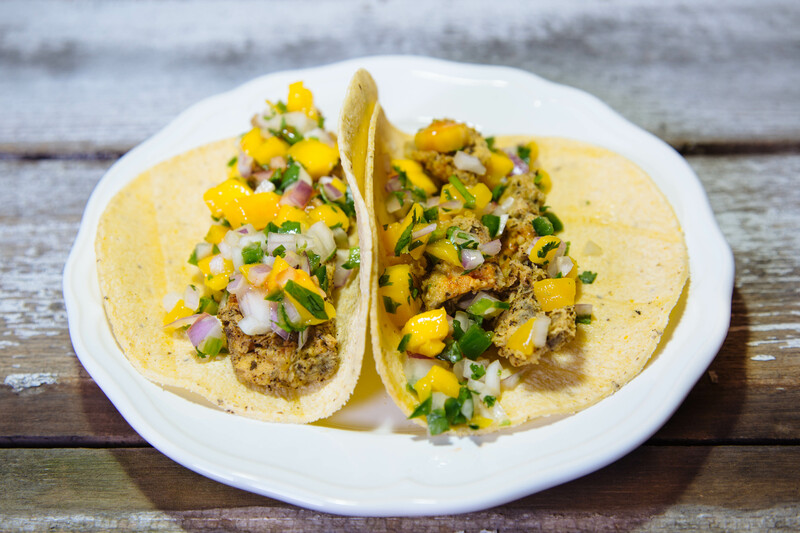 Learn how to make delicious breaded fish tacos out of mushrooms! These vegan/vegetarian tacos are crazy easy with ingredients you for sure already have in your pantry. Fish tacos can be filled with either breaded and fried (not healthy!) or grilled/baked (healthy!) mushrooms. Obviously we went with fried, because life is so much more fun with breaded food! Combine first 6 ingredients to make your spicy mango salsa and set aside. Add oil to a large heavy pan and heat over medium-high heat until a frying or candy thermometer reads 375 degrees F. Reduce heat to medium as not to burn the oil, but keep it at a consistent temperature. In a medium size bowl, combine flour, seaweed, black pepper, 1 teaspoon salt, and garlic powder, stirring with a whisk to combine well. In a separate bowl, combine egg replacer and almond milk and whisk until well combined. Coat mushrooms in the flour mixture and dredge in the egg replacer mixture, and back to the flour until evenly coated. Carefully add 4 or 5 mushroom “fish” pieces to the hot oil, and cook 3 to 5 minutes or until golden brown and heated through, turning occasionally. Remove “fish” pieces from hot oil and place on a plate lined with paper towel to blot and remove excess oil. Allow 5 minutes between batches for the oil to heat up again to 375. Repeat procedure until you are out of mushroom “fish”! Heat corn tortillas in the oven for a few minutes. Divide the mushroom “fish” evenly between the tortillas and add salsa. I also love to add my favourite hot sauce! 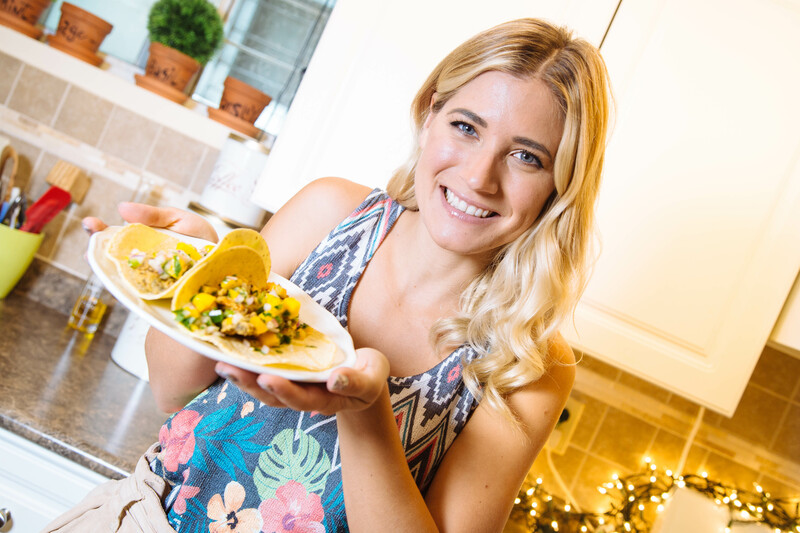 Check out this video where I show you how to make vegetarian tacos!